iPhoto’s various photo-effect features—such as Enhance, Sepia, Fade Color, and Edge Blur—and its handy Adjust palette make it easy to tweak a photo to your liking. Unfortunately, if you’ve got a bunch of images that need the same tweaking, you have to edit each one individually. Unless you use feroXsoft’s iPhoto Batch Enhancer 2.0.3i ( ; payment requested), that is. After installing iPhoto Batch Enhancer, you can apply effects, as well as the refinements found in iPhoto’s Adjust palette, to multiple photos simultaneously. This can be quite useful if you’ve taken a number of photos under similar conditions—for example, underwater photos or a group of pictures taken in the same poor lighting—and you need to apply the same enhancements to every photo in the lot. To use iPhoto Batch Enhancer, you first choose, in the main iPhoto window, the photos you want to alter. Then switch to iPhoto Batch Enhancer and choose your enhancements. 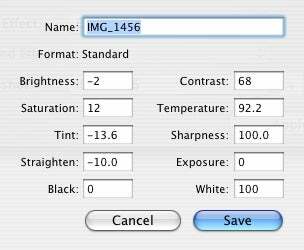 If you’re simply applying one of iPhoto’s stock Effects, you check the First Effect box, choose the desired effect, and then click on Apply; iPhoto Batch Enhancer proceeds to make those changes. If you’re using iPhoto 6 or later, you can also apply a second Effect by checking the Second Effect box and choosing the second Effect. The process isn’t fast; because iPhoto Batch Enhancer uses AppleScript and Apple’s UI Scripting technology, your changes are made to each image as if you manually applied them yourself—iPhoto switches to an image, switches to Edit view, applies the changes, exits Edit view, and then moves on to the next image. And you can’t do other things on your Mac while these changes are being made; iPhoto must remain the frontmost app. So the advantage of iPhoto Batch Enhancer isn’t time savings; for example, applying the Black & White effect to three photos took 22 seconds on a Mac Pro. What you are saving is effort and your hands’ health; you can start your batch-enhancements before going to lunch, or before going to bed at night, and they’ll be done when you get back. You can then apply this new Adjust snapshot to multiple photos just as you do First and Second Effects; just check the box next to Snapshot, choose the desired snapshot from the pop-up menu, and click Apply. You can even save snapshots and import them into iPhoto Batch Enhancer on another computer. iPhoto Batch Enhancer requires that OS X’s UI Scripting be activated. This setting is accessible via the Universal Access pane of System Preferences; check the box for “Enable access for assistive devices.” Also note that iPhoto Batch Enhancer’s documentation warns of the possibility of an occasional “NSReceiverEvaluationScriptError: 4” error when using iPhoto Batch Enhancer; feroXsoft points out that this error can usually be solved by restarting iPhoto. However, I didn’t experienced such an error in my testing. Although it’s fairly slow—and takes over your computer while it does its thing—iPhoto Batch Enhancer is a handy way to work around a serious limitation of iPhoto’s photo-editing functionality. iPhoto Batch Enhancer is a Universal Binary and requires Mac OS X 10.3.9 or later, as well as iPhoto 2 or later; iPhoto 4 and later provide many more image tools supported by iPhoto Batch Enhancer.